I love making quick and easy blender soups. When you’re cooking gluten-free, using pureed vegetables to thicken the soup is a great trick. And, I think it gives the soup more flavor. Using a high-speed blender like the Blendtec makes the soup velvety smooth. You won’t miss the flour from traditional roux-based soups. Asparagus is my favorite spring vegetable. The flavor blends wonderfully with the shallots and ghee. I like to use ghee, which is butter with the milk solids removed, but regular butter will work just as well. 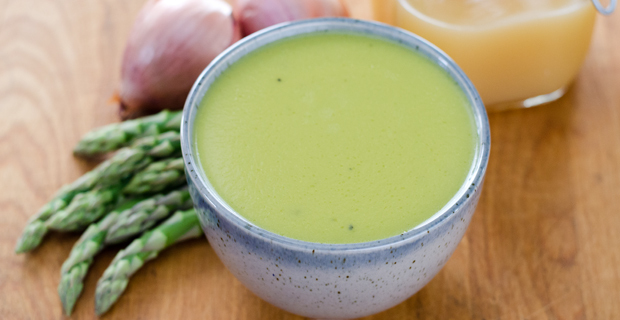 This is a fantastic soup for a starter or light lunch, and a perfect use for fresh spring asparagus. Cook shallots in ghee or butter with a pinch of salt until soft, about 5 minutes. Add asparagus and chicken stock. Bring to a boil, reduce heat and simmer 5 minutes. Carefully add to Blendtec blender and process on soup setting. Season to taste with salt and pepper. Lisa Wells is the author of Cook Eat Paleo, where she shares quick and easy gluten-free, grain-free recipes made with real whole food ingredients. Follow Lisa on Pinterest, Facebook, and Twitter. I love this simple to make and delicious soup. I also add about two tablespoons of lemon juice and parmesan cheese. I justs made this soup and it is really delicious. I also added about 1/2 cup of parmesan cheese and the juice of 1/2 of a lemon. I also added 1 tsp of salt and 1/2 tsp of pepper. Delicious!